It's been quite a special summer with my girls expanding into our artistic talents. Jennifer, my oldest daughter is visiting and that means time to dig into my drawing stash. We experimented with new Copic Markers and water color pencils. How did I live without them before? They are yummy. With my new found love, I made opportunity to try out drawing on old book pages. 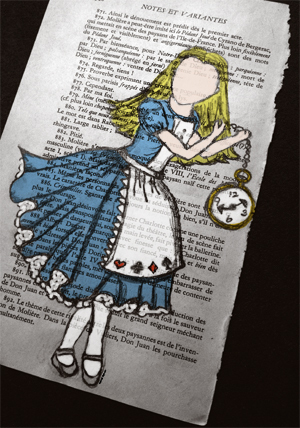 Here is my Alice in Wonderland. Can't wait to design more.